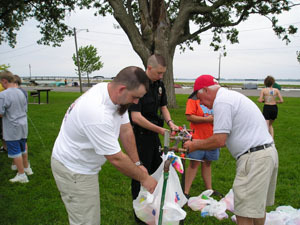 Celina law enforcement officers and friends filled more than 2,500 balloons with water Thursday afternoon for the annual party celebrating last day of school, hosted by the Celina City Police Department. Along with the water-balloon war, kids could run through a fire-hose waterfall, enjoy music and pizza. This trio tries to keep up with the demand for filled balloons: Holt McNelly, Colin Fuelling and John Garbig (in ball cap).